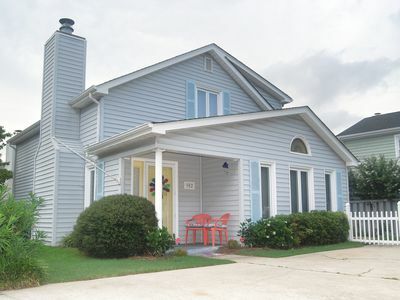 Renovated Bungalow less than 1 minute walk to the beach! 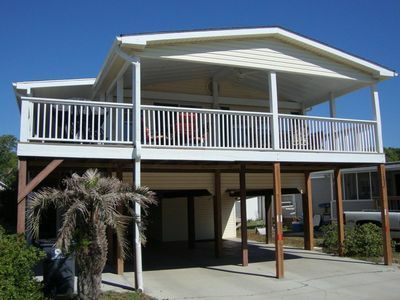 Relax on our deck, see the ocean, and hear the waves breaking. 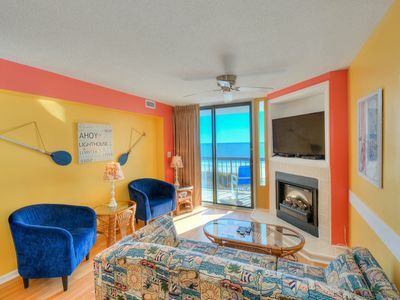 Our home is located in Oceanside Village (a private, family-oriented, gated community) in Surfside Beach between the Surfside and Garden City Piers. 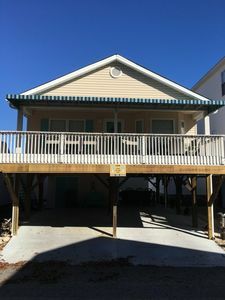 We have a spacious, covered and painted deck providing cool breezes with an ocean view where you can use the gas grill and enjoy outdoor dining on the two tables with chairs. Inside (in 2013), we added wainscoting, window casements, new light fixtures, fresh paint, and some new plumbing fixtures. In 2014 we installed laminate flooring throughout the home, and completely remodeled the king bedroom's private bathroom to include a shower/bathtub combination and new sink. 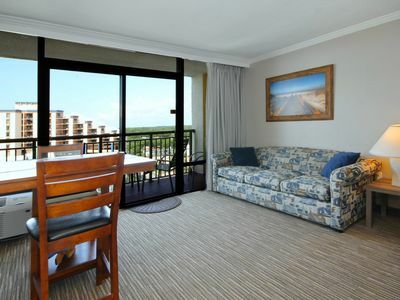 Two bedrooms (one king and one queen), and a pull out queen size sofa accomodates six comfortably. 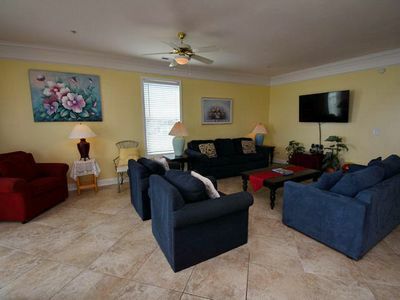 The king bedroom has a private bathroom (remodeled in 2014), and separate entrance leading to a secluded deck. The closet and dresser offer ample storage. It also has a 32in flat screen TV with cable. 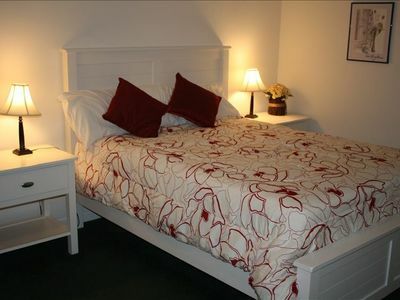 The second bedroom has a queen bed, large dresser, and a 24in flat screen TV with cable. Its walk-in closet has plenty of space with a stack washer and dryer, ironing board, and iron. The kitchen features a refrigerator with ice maker (added in 2015), dishwasher, disposal, flat surface stove and oven, a microwave, toaster, coffee maker, blender, and all cookware including dishes and utensils. 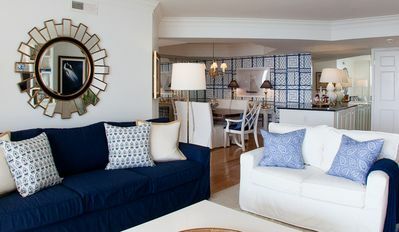 The kitchen also has a large eat-in bar with three stools for casual dining and a separate dining room with an ocean view that seats six. 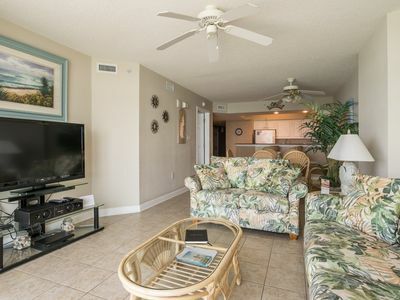 The spacious living room has a love seat, recliner, and a comfortable sofa which pulls out into a queen size bed. 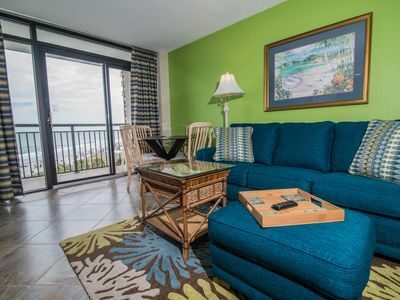 There is a 42in flat screen TV with cable, DVD player, stereo, and free WIFI internet connection for the house. There are ceiling fans throughout. The concrete parking area below can accommodate 4 vehicles easily. There is a private outdoor shower (cold only). Borrow a beach chair from the outdoor bin and have fun on the beach - which is less than a minute's walk. We love pets, but we have a strict NO PETS policy for the entire property (inside, outside, decks, parking area, and planted/landscape areas). 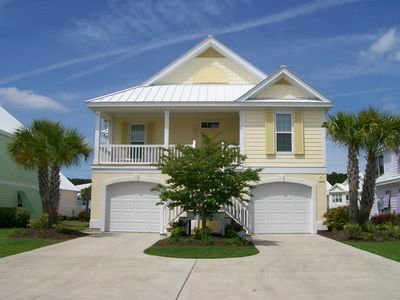 A golf cart is not included with the home. 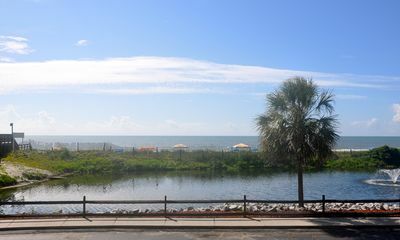 Upon arrival, visit the Oceanside Village Office if you would like access to oceanfront parking in the lot beside the Conch Cafe, golf cart rental, or use of the fitness center (separate fees apply for these features). OSV does not allow non-resident golf carts. 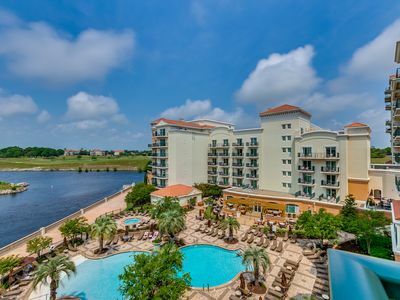 You can enjoy complementary use of the indoor (heated) and outdoor pools, a children's water park with a lounge cooling area, lighted tennis courts, volleyball courts, a basketball court, a baseball field, bocce and horseshoe courts, a park/playground area, and many fishing lakes around the 180-acre property. 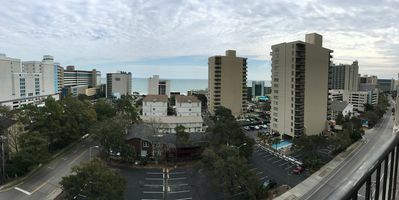 Oceanside Village is a short drive north to Market Common, Myrtle Beach, and other area attractions or south to Murrell's Inlet and Pawley's Island for great seafood, nightlife, and specialty shops. 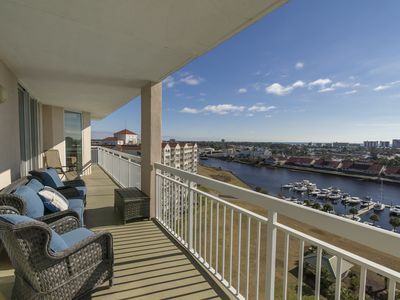 Area attractions include over 100 golf courses - Tupelo Bay is just across Hwy 17 from Oceanside Village. Miniature golf courses are close, too. Fish from one of the two nearby piers (Surfside and Garden City), go off shore on a charter out of Murrell's Inlet, or surf fish with a SC fishing license. There are many more water activities to choose from including kayaking, parasailing, jet skiing, banana boating, and several different water tours. 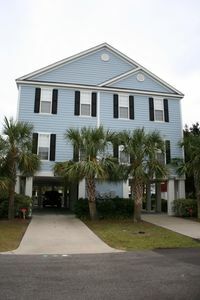 Abundant shopping is available within a short drive at Inlet Square Mall, Market Common, Coastal Grand Mall, Barefoot Landing, or Broadway at the Beach. 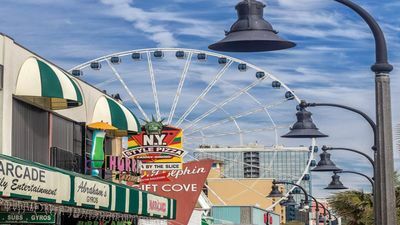 Visit the official Myrtle Beach tourism website for great vacation information. 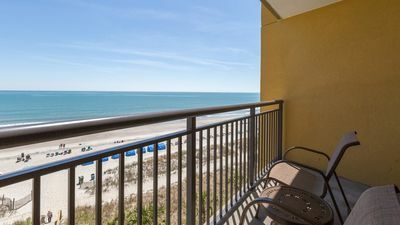 Relax on Myrtle Beach with Towers on the Grove! 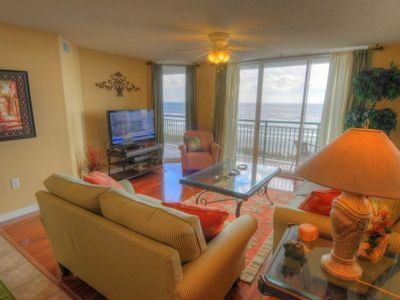 Crescent Keyes - 1103 Comfortable 2-bedroom condo overlooking the beach! 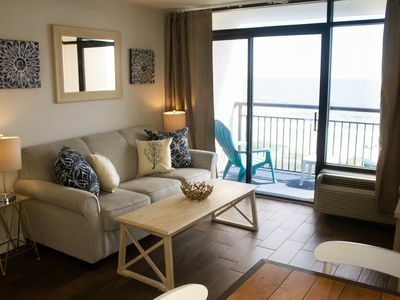 Rental for 8 with Oceanfront Balcony | Private Beach + Spa On-Site! NEW TO RENTAL! 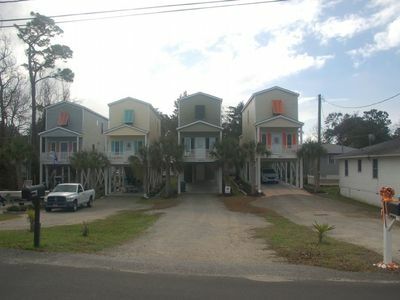 3 BEDROOM 2 BATH HOUSE 4 BLOCKS TO THE BEACH!!! 253 Georges Bay Road (upstairs) located in Bermuda Bay.